The Wikipedians of Slovenia User Group (Uporabniška skupina Slovenski wikipedisti) is a Wikimedia user group representing Wikimedians in Slovenia and dedicated to promote Wikimedia's mission in Slovene-speaking areas. Any user in good standing on any Slovene Wikimedia project wishing to participate actively is invited to list him-/herself as a member. 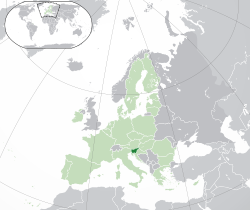 To aid and encourage people to collect, develop and disseminate freely licensed educational content available for reuse, distributing and modifying by anyone, with focus on Slovene-speaking areas. To encourage public and private galleries, libraries, archives and museums in Slovenia to make their holdings more broadly and freely available and to collaborate with these institutions in an effort to preserve Slovenian heritage. To facilitate participation in international initiatives in the Wikimedia space, such as Wiki Loves Monuments. To generally act as a conduit between the community of Slovene Wikimedia projects and the Wikimedia movement on an international level. 16–17 May 2019: Two members will participate in the conference "Societal and economic aspects of the use of digitalized cultural heritage in Slovenia", talking about the import of the Slovenian Registry of Cultural Heritage and planned activities around it. No specific activities planned currently. Work is underway to set up the framework for our country's participation in WikiLoves monuments 2019. If you have relevant skills, please help with the Phabricator ticket. The group was founded at a meeting on 2 November 2018 in Oton Župančič Library, Ljubljana, spurred by the change in accessibility of the Slovenian Registry of Cultural Heritage, which would enable the community to organize a Wiki Loves Monuments competition. Report from the meeting is available here (in Slovene). An application for official recognition by the Wikimedia Foundation was submitted on 4 November and approved on 14 December 2018. You can contact us at the talk page here, or the Pod lipo discussion page on the Slovene Wikipedia. Currently there is no formalized structure of the group, membership is open to any Wikimedian in good standing who wishes to contribute to this group's goals. To join the group, please add your name and/or nickname to the list. Feel free to ask if you have any questions. This page was last edited on 16 April 2019, at 09:26.